In 1967, with the race to the moon in full swing, kids across America dreamed of becoming Gemini astronauts when they grew up. Walking on the moon was no longer a distant fantasy, but a scant two years away. It was then that Mattel Toys, hoping to cash in on the craze, released what was to become one of their most popular and best remembered toy lines of all time: Major Matt Mason, Mattel's very own Man In Space. Though lasting only about four years, from 1967 until its demise in 1970, Major Matt Mason comprised one of the most inventive and memorable toy lines ever. Standing only 6" tall, the white-suited Matt Mason figure was fully poseable with his wire-reinforced rubber body. His space suit and helmet were supposedly based on real NASA designs, but even if they weren't exactly accurate, they looked right for the part, mixing realism with plenty of futuristic fantasy. But even better than the figure itself -- which was joined by Sgt. Storm, Doug Davis, and Jeff Long in the ensuing years (wearing red, yellow, and blue spacesuits respectively) -- were the amazing accessories and motorized vehicles that supported these figures and increased their play-value considerably. Even today, thirty years later, the distinctive Space Crawler is apt to bring back fond memories to anyone who was a kid in those days. The first year saw the standard Major Matt Mason figure packaged on a card with Flight Set accessories and on a second card that also included a Moon Suit: a clunky, bell-shaped outfit designed to protect Matt from the "hostile environment" of space. The Moon Suit used an attachable plastic air pump to control its rubber arms, the same sort of bellows device that was also used for later accessories. The Flight Set included a two-piece Space Sled and a Jet Propulsion Pak that allowed Matt to fly along on a string. The pak could also be attached to the Space Sled, enabling that device to fly as well. The previously mentioned Space Crawler was sold that first year and quickly became the staple of Major Matt Mason transportation sets. Its battery- powered 4-spoked "wheels" could navigate almost any terrain and worked wonderfully on the moon surface...er, in the sandbox. But perhaps the most impressive of all the toys is the Space Station itself, towering over two feet high on orange girders and white honeycombed platforms. With three levels, blue-tinted plastic windows, and a flashing radar beacon, it was highly adaptable and made for hours of fun. Toy makers of today could take a lesson from how it was designed. Many Space Stations can still be found in their many packaging variations -- it was sold with or without various figures and vehicles -- but often the smaller pieces are missing or broken. In 1968, the aforementioned Sgt. Storm was added to the MMM line. He (along with a repackaged Matt) was sold on a blister- card with a Lunar Trac, a neat-looking, but unfortunately non- functional treaded vehicle. Doug Davis and Jeff Long were released in 1969. Jeff, an African-American figure, is the toughest human figure to find and is the most expensive. The White-suited Major Matt Mason figure can be readily found for as little as $25, but can go higher if he has perfect paint, no broken wires, and a complete helmet and visor. There were also several alien figures added to the MMM line, the most familiar of which is Callisto. Best known for his green, semi-transparent head, Callisto (released in 1969) came with a purple Space Sensor that attached to his shoulder. It was operated by a bellows that could fire and retract a yellow string. Much harder to find because he was released only in 1970 is Scorpio, a slightly larger pink and purple alien who fired "search globes" from a green harness strapped to his chest (again operated by a bellows). His detachable arm and leg shields are frequently missing, driving up the cost of loose mint figures. Perhaps the oddest figure in the MMM line is Captain Lazer, "Matt's friend from outer space," who seems to have been added to the line only to capitalize on the Major Matt Mason name. Towering over Matt and his friends, Captain Lazer is the size of a G.I. Joe doll and is made of a hard plastic instead of the bendable rubber of the other figures. His battery operated backpack allows you to light up either his eyes, his chest, or the clear plastic attachments to his non-removable gun. It should be noted that Mattel re-used the Captain Lazer mold in 1978 for the large figures in its Battlestar Galactica line. A final alien, named Or from Orion, was packaged only with the flying Orbitor spacecraft. A tiny crab-like creature, he was designed to sit inside the 12" Orbitor, a flying disc that you could launch, spinning, into the air. Though Mattel included it in its 1970 catalog, most collectors insist Or was never produced beyond the prototype stage. Continuing with the accessory paks, Mattel also released on blister card the Space Probe, the Rocket Launcher, the Reconojet, the Satellite Launcher, the Space Shelter, the Space Power Suit, the Gamma Ray Guard, and the Supernaut Power-Limbs. The last four of these were also released in harder-to-find boxed versions in 1970 and Matt himself was added to a Power Suit and Power Limbs combo known as the Super Power Set. The Moon Suit and Space Travel Pak (also known as the Flight Set) were also available without the Matt Mason figures. Most distinctive of the additional vehicles -- some of the most inventive ever designed -- was the Space Bubble, a clear plastic globe that could be pulled by the Uni-Tred, a motorized red moon explorer that moved along on a single tank-like tread. With Matt secured in the Bubble's "gyro-seat," the globe would rotate around him as it moved forward, with the figure always remaining upright. Another vehicle was the Astro-Trac, which looks the closest to NASA's real Lunar Rover, which is to say a lunar dune buggy. It, too, was battery-powered and is notable for its large foam-covered rear wheels. Unfortunately, the soft foam tires tend to disintegrate over the years, so the Astro-Trac is often found with just the rear hubs. The Astro-Trac was also included with the Space Missile Convoy set that was available only at Sears. Unique to this set are the 3 "launch pad" vehicles that were designed to carry such accessories as the Rocket Launcher or Space Probe. Also in this set was a 40x24- inch molded vinyl moonscape. The Firebolt Space Cannon was scaled to work with either Matt or Captain Lazer at the controls and was often packaged with the oversized Captain. All of the vehicles were sold either individually or in various combinations, some with figures. The Lunar Base Command Set, for example, included the Space Station, Space Crawler, Uni-Tread and Bubble, as well as Major Matt Mason and Callisto. To hold the various figures and small accessories is the vinyl Satellite Locker, which has three compartments, one of which is fronted by clear plastic so that you can view Matt or his friends inside. There is also a Rocket Ship case designed like... well, a rocket. You can also store a couple of figures in the Talking Command Console, but this piece is much more fun when opened up to reveal its two seats, lighted control panel, and star field. This uses an often troublesome pull-string talking mechanism, so although the console once played back 10 exciting space phrases (such as "Ready for blast-off...3... 2...1"), it's hard to find one that still works. The Talking MMM Flight Pak was better designed and often still works to this day. Similar to, but larger than, the Jet Propulsion Pak, this orange backpack-like device plays back 5 different phrases ("Mission accomplished...Returning to ship") as the figure glides along its string. It was sold in its own box with a Major Matt Mason figure. The talking backpack was also sold packaged with the XRG-1 Reentry Glider. The Glider is large enough to seat Matt in its clear cockpit and lightweight enough to actually fly him through the air. Rounding out the MMM line is the battery-powered Star Seeker, whose "memory guidance system" allows you to program its path across your kitchen floor and evade a paper cut-out solar system that can be set up around it. Though not exactly toys, the MMM line was supplemented by several other items, including a Big Little Book (titled "Moon Mission"), a coloring book, a frame tray puzzle, and a 125-piece round puzzle, all manufactured by Whitman. For Halloween, there was a Major Matt Mason mask and costume. Mattel also released the oversized 3-D Space Exploration boardgame. 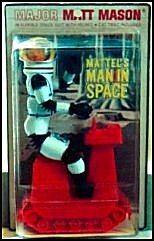 By 1970, just as with NASA's real space program, the toy- buying public began to lose interest in Mattel's Man in Space and the Major Matt Mason line came to a premature end. Still, even 30 years later, it remains one of the best-remembered toys of the Sixties, capturing the interest of both action figure collectors and of those who fondly remember Mankind's brief journeys to the moon.